Within the next week you may begin seeing some problems with some Florida tomatoes, if you happen to see any Florida tomatoes at all. The recent nights of below freezing temperatures produced some major issues for the Florida tomato growers. The complete picture of damage will not be known for a few more weeks. Alternaria Rot is a fungus disease to tomatoes that may occur wherever tomatoes are grown. The fungus causing this decay is a weak pathogen that is usually unable to cause an active rot on sound, uninjured, green tomatoes. Unfortunately tomatoes that have been subjected to cold temperatures too long are extremely vulnerable to Alternaria rot. Typical symptoms on chill-injured fruit are a ring of decay around the stem scars and numerous lesions at skin breaks over the surface of the fruits. The lesions are shallow, sunken, and grayish black and will become darker in color turning black. 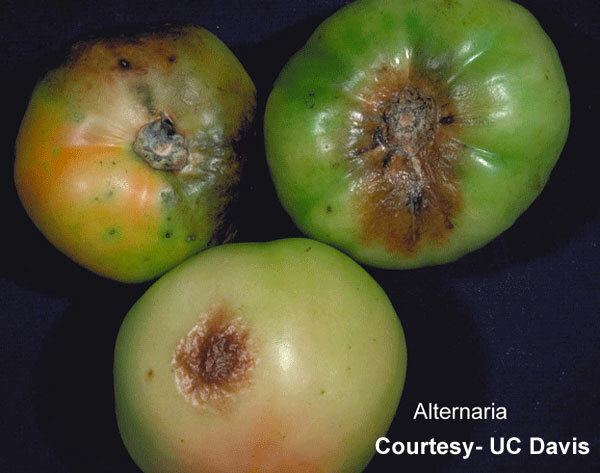 Alternaria does not produce a watery-leaking decay, as the infected tomatoes usually remain firm. When the fungus produces some black mold spores the chance of spreading the decay to adjacent sound tomatoes is increased. The USDA Grade Standard allows for 5% of the tomatoes being soft or decayed.